We’re close to the English border here and Chad is an English saint rather than Welsh, having a wide scattering of churches and wells dedicated to him across England; even still there are suggestions that his name implies some Welsh or Celtic ancestry. He was bishop of Mercia towards the end of his life and there are stories that he visited Hanmer in around 670 (he died in 672), performing baptisms in a lake now called Llyn Bedydd. The settlement retained the name Chadhill for some 500 years until it was renamed Hanmer sometime in the late twelfth century. Despite its dedication to a saint from across the border, the church holds an important place in Welsh history. 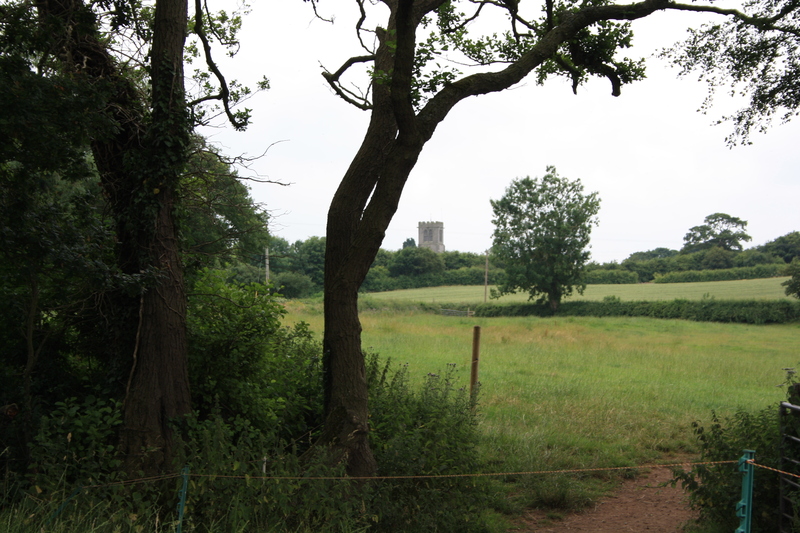 It was here that Owain Glyndwr was married to Margaret, daughter of Sir David Hanmer, in 1380. The church now is a distant relative of the churches that stood in earlier times. Massive fires destroyed successive church buildings in 1463 and in 1889, so the present building is largely modern in construction, dating from the late nineteenth century and completed in the 1930s, although the 1720 chancel remains relatively intact. 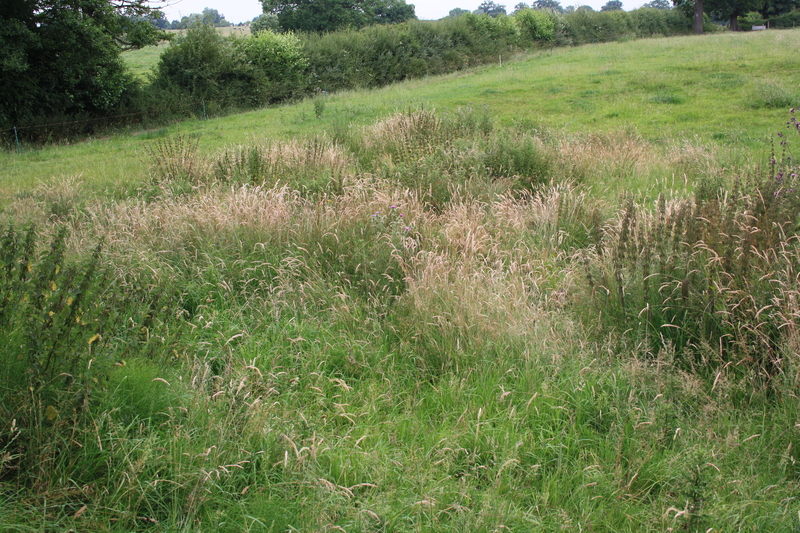 However,by the 1970s the spring had dried up so much that that visitors then reported it as merely “a marshy hollow” trampled by cattle. The spring was first disturbed by drainage works in the mid nineteenth century. John, Lord Hanmer himself, in his memoir of the parish, holds up his hands as being “without intention” the guilty party. He also records that up until the early part of the nineteenth century Hanmer Hall was supplied with water from St Chad’s Well, being taken twice a day in a barrel. 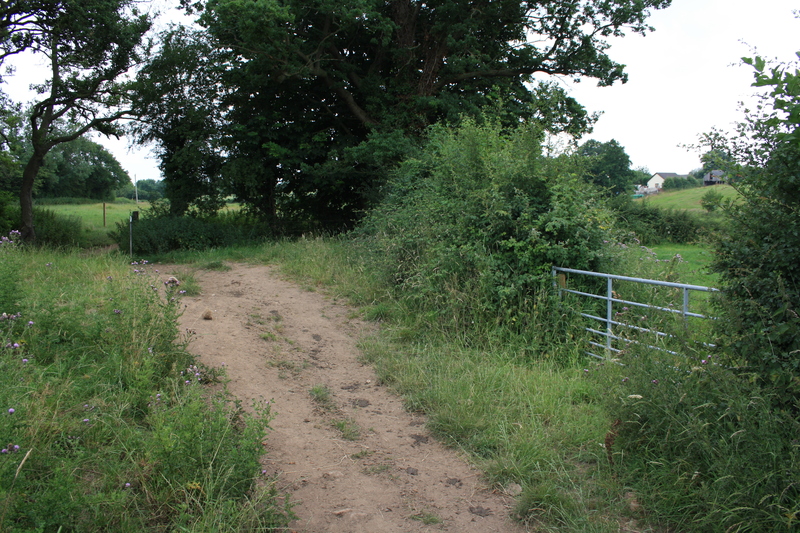 Both sites were dry at the time of our visit, although a gully containing water flows along the hedge by the gate. St Chads’s Well is one of the many wells which has largely disappeared through lack of use and neglect despite its links with Hamner church. A memorial of the Parish and Family of Hanmer. John Lord Hanmer , privately printed 1877. CPAT Report 1090. Silvester et al, 2011. There may be another ‘lost’ well round here, a couple of miles away. There’s an 1877 article in Archaeologia Cambrensis on place names in the Maelor, which briefly mentions a ‘ffynnon llwyn’ about 150 yards southeast of the motte and bailey at Eglwys Cross on the present day A525 (I think). Although a lot of the article is the usual Victorian ‘antiquarian’ gibberish, the author says “the present fynnon…has the appearance of having been a large bath”. Not one I’ve found a reference to elsewhere. great – thanks for the tip – one that I shall certainly be following up very soon.